For the most part, treatments for genetic diseases have fallen into the preventive, disease management, or palliative categories. This is largely because genetic conditions are caused by harmful changes in our DNA, our body’s most fundamental instruction manual. Without correcting those changes, the idea of curing a genetic disease has been just outside of our reach. That’s where gene therapy comes into play. 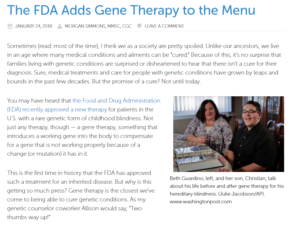 You may remember that in January 2018, I wrote about an important milestone in the genetics space – the FDA approval of the first gene therapy treatment. While monumental in its own right, numerous news stories detailing the promising results of other gene therapy clinical trials have appeared in the months since (Duchenne Muscular Dystrophy,Hemophilia B, and Sickle Cell disease, just to name a few). Unlike crop tops and man buns, I’m fairly confident that this is a trend here to stay. In an attempt to get ahead of the curve, I wanted to delve a little deeper into not only the basics of how gene therapy works, but also some reasons why it’s taking us so long to get it right. At its core, gene therapy involves the introduction of DNA into an individual’s body to treat, prevent, or cure a genetic disease. Although every cell in our body contains DNA, these cells are often divided into somatic or germ line cells. Somatic cells are every cell in the body except for those cells which make eggs or sperm, which are considered germ line cells. While gene therapy can target either germ line or somatic cells, it can change the potential outcome for the patient and the generations of patients to come. Before I explain this idea, let’s first talk a little bit more about the methods behind gene therapy. Do you remember learning about the Trojan War in school? You know, the one where the Greeks built a large wooden horse to sneak their troops into the city of Troy and win the war? No? Well, read about it here. This is similar to gene therapy. Unfortunately, we can’t just inject some DNA into someone’s arm and expect it to get itself where it needs to go. We need a vehicle. Something to guide the corrected DNA to the problem area and to help coax things along. We need a Trojan horse. The way we do this is by using a vector like a virus, plasmid, or bacterium. Viruses have evolved in such a way that they can enter other cells and infect the cell by delivering their own DNA. Scientists can alter the virus’s DNA to not only make it not harmful to humans, but also to insert a section of DNA containing the corrected version of the gene or a new gene that could help fight the disease. Once inside, the DNA can be utilized by the cell and treat the patient’s disease. Simple enough, right? Let’s get back to the idea of germ line and somatic cells. If we were to use gene therapy and target somatic cells (remember: every cell in the body that doesn’t make eggs or sperm), we’re only going to treat that specific person’s genetic disease. This means although this person may be cured of their genetic condition, they would still be at risk to pass the genetic change causing their genetic disease onto their children. However, if we were to target the germ line cells, we’d be altering the person’s risk to have a child with the genetic disease, but not treating the patient at hand. If we target the germ line cells early enough in development (think: developing embryo), the corrected DNA could get integrated into both somatic and germ line cells throughout the body. By doing so, we’d be not only preventing that person from having a genetic disease, but also preventing their children and the generations to follow from also having the same genetic diagnosis. Gene therapy itself has created a little controversy. For some of you, maybe this all sounds too good to be true. For others, maybe it sounds like this would allow us to “play God” by altering the future. I’m also fairly confident that many you wondering why it’s taking so long for this to be readily available. Gene therapy has been around for decades and the technique behind gene editing was first developed in 1972. For starters, just because the corrected DNA makes it into the cell doesn’t mean that the instructions provided by the now functional gene will be used. The cell may have noticed there was something wrong with the original version of the gene and decided to turn it off, just to be safe. If this is the case, although we’ve replaced the malfunctioning copy, it doesn’t mean that the cell will read it. Second, although we’re altering the virus in a way that makes it not harmful to humans, it’s still a foreign object and as such, the body could decide to trigger an immune response that could be harmful to the patient. There’s also the possibility that the corrected DNA could get inserted into the wrong gene. If this happens, the wrong gene previously working as expected, could stop working in turn causing more problems for the individual. While the technology behind gene therapy seems simple enough, getting all the pieces to fall into place is pretty difficult. It’s going to take many clinical trials and years of closely following those individuals to make sure we fully understand how safe it is (and how long it lasts) before it hits the big stage. We’ve already seen this type of treatment to come with a hefty price tag. It’s possible that some of these gene therapy treatments may need to be repeated several times over the course of one’s lifetime. If this is the case, it could go from super expensive to practically unattainable very quickly. However, it’s hopeful that as the technology advances, the price tag for this type of treatment will decrease. I am fascinated and hopeful about gene therapy because we have a familial disorder that we’d love to “cure”. I am a carrier for the genetic mutation that causes severe hemophilia A. I am basically unaffected by this genetic mutation but, being an X-linked recessive disorder, one of my son’s has the disorder. He is now a young adult and has expressed interest in gene therapy somewhere down the line (he’s a wait and see kind of guy so he’ll jump in after its safety and efficacy are pretty well established). I am the first in my family to have this mutation. My mom is not a carrier (established by genetic testing) and my father does not have the disease. My question is, could my father have a germ line mutation but not have the disease itself? Is that a way to have passed it down to me while being a “carrier” of sorts? I always thought the males had to have the disease to pass it to their daughters (obligate carriers) but now I am doubting myself. Hi, Allison! You bring up a great question. It’s possible that your mutation was the result of a germline mutation in either your mother or your father. It’s also possible that your mutation occurred when you were a developing embryo and the mutation was copied to other cells as you grew and developed. If I remember correctly, about 1/3 of people who are diagnosed with hemophilia have a new mutation that is not present in other family members. This is a super helpful article. I kept hearing about the power of gene therapy but this really boils down it down to something I can understand. It’s pretty exciting and I can see the controversy around it too. Most of the time you hear fears about designer babies but this is an implication of technology that could change lives in a positive light — if we can get it right. Thank you Morgan! Thanks for reading, Ruth! This is certainly exciting technology with a promising future! Hi Donna and thanks for reading! I’m very hopeful that scientists will be able to come up with new therapies that not only work better, but also last longer than what we currently have. Whether or not these new therapies use gene therapy techniques, there’s certainly room to grow and improve! Another gift from Morgan. Understanding gene therapy is made simple by Morgan and we look forward to learning more about this evolving topic and her wonderful analogies. Follow Morgan and ThinkGenetic as she keeps us abreast of the hurdles, successes and hope for the future. Thanks for your kind post, Carol! Is this gene therapy also helping in Nimaline Mayopathy- Acta1 gene ? Hi, Monty! Thanks for checking out this post. As far as I can tell, there aren’t currently any gene therapy trials for Nemaline Myopathy caused by mutations in the ACTA1 gene. The Nemaline Myopathy Support group (http://www.nemaline.org/research/geneexpress.html) has touched on this topic in the past and will likely provide updates should things change in the future.